IN AMONGST the glorious highs and the heart-breaking lows of a dramatic year on the green baize, Cuestars players have (sometimes unwittingly) produced some laugh-out-loud moments. New Cuestars sponsor Ian Bell, boss of Poole-based decorating contractor Bell’s Decor Ltd, reckons nothing has changed since he was a youngster on the junior circuit. David O’Callaghan won the Cuestars Silver leg in Fareham despite dislocated his left knee while competing in the Dorset Open at the Ambassador Club in Poole at the end of January. Christian Chislett, an ethical computer hacker who struggles to get his cue on line, wins his first Cuestars Championship Tour event in Bournemouth. Dan Hammond was mistaken for a drug dealer while sitting in his car during a long wait between matches on the Cuestars Seniors Tour in Bournemouth. Staff at the Kings Arms pub, which shares a car park with the snooker club, became suspicious of the man on his phone. Two of then tapped on his window and asked if he was all right. Once Hammond explained he was actually in a snooker tournament, they revealed their concerns that he was a drug dealer! It was only funny if you weren’t competing in or organising the event! A total of 48 players turned up for the third leg of the Cuestars Championship Tour at the nine-table Top Spot Snooker Club, Havant. The final ended at eight minutes past midnight. 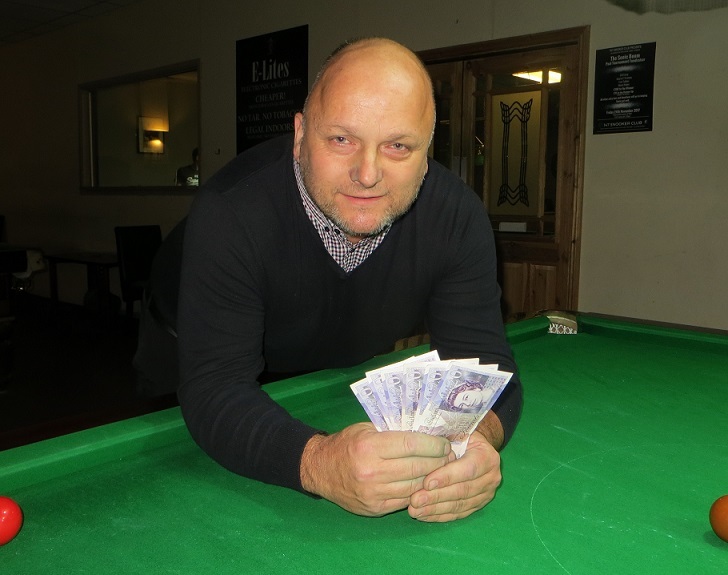 The following Sunday, Wayne Muddiman (pictured) got lost in the Swindon Station car park, arrived late at the 147 Snooker Club for the third leg of the Cuestars Seniors Tour, won the event and got lost trying to find the exit from the car park.